It's been just over a month since Banksy caused a stir with a new Diamond Jubilee inspired piece of street art in Turnpike Lane, North London. 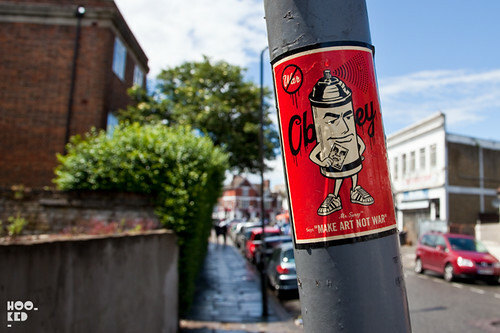 Now just a stone's throw from the Banksy piece another street art giant has hit the streets of Turnpike Lane. 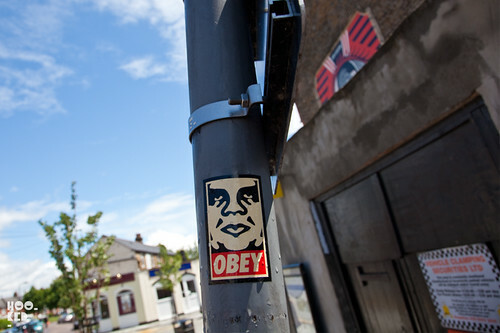 Friday saw Shephard Fairey aka OBEY in North London installing a new mural just next to the Turnpike Lane Underground station. 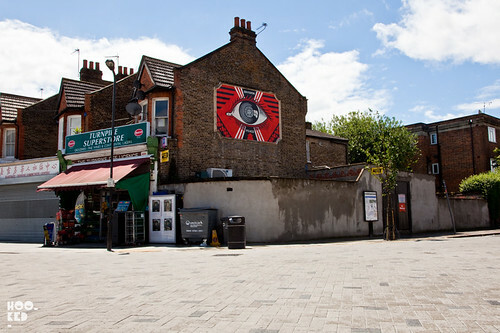 According to the Guardian the mural was a commisioned piece installed without charge and organised by local resident James Straffon with the help of a London Gallery. 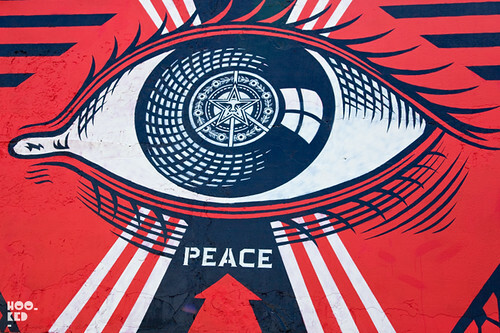 The "Envision Peace' mural pictured, is above a local corner shop and sees Fairey make use of an old disused Victorian placard. The mural is part of a larger community regeneration programme that is being carried out by the local Haringey council and is the second such project Fairey has worked in the last week. Before his stop in London, Fairey was in Paris working on another local community regeneration project but on much larger scale. Our London friend and photographer Butterfly was in Paris and captured the action.The work located on 93 rue Jeanne d’Arc was painted onto a 14 storey building, check the timelapse below of the Paris piece. 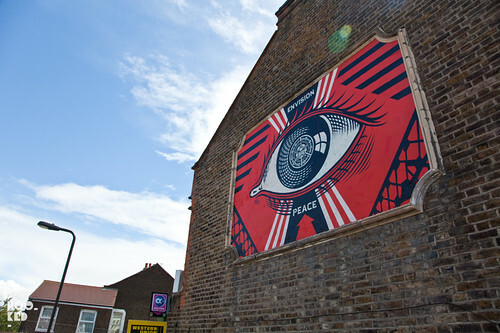 For those of you interested is seeing/photographing the Shepard Fairey London mural it is located on Langham Road next to the Turnpike Lane Underground Station. And if you haven't already seen it be sure and check this North London Banksy stencil just across the road.